With its cheerful pastel decor and quaint art work Bumper's Nest is indicative of the old world charm of Jamaica. A lush colorful garden greets you on entering and amid this is a water fountain in the shape of a fish made from wrought iron and Verde in color unique only to Bumper's Nest. 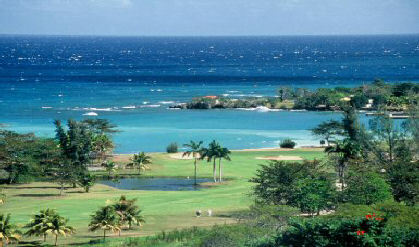 From its elevated position near the 14th hole, it affords a stunning view over the golf course and ocean beyond. The villa is set in the midst of a beautiful three-acre garden, complete with its own chipping-and-putting green, two sand-bunkers and a 52 foot poll with underwater speakers and lighting. Bumpers Nest comes equipped with an extra large television in the family room, a fax machine, internet access, CD payers and a VCR. Each en-suite bedroom is air-conditioned, tastefully and uniquiely decorated providing one king size and four double beds. There are six staff members, Butler (Household Head), Cook, Maid, Laundress, and 2 gardeners.